We use clocks to keep us on schedule each day. The changing seasons help us follow a yearly rhythm. But did you know your body has its own clock? In fact, it has more than one. 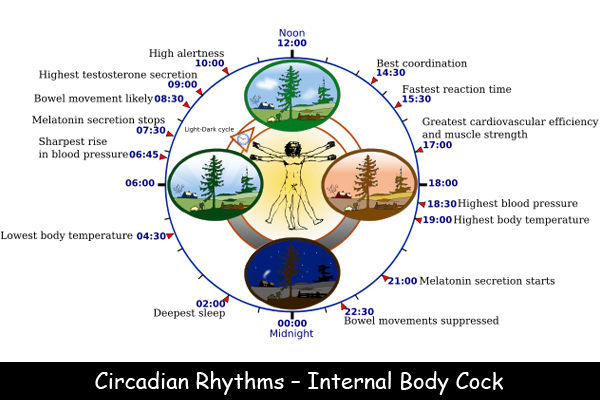 Circadian rhythms are your body’s internal clock(s). These rhythms are controlled by the hypothalamus, a small part of your brain. Circadian rhythms control our sleep cycles. They tell us when we’re sleepy and when we feel energized. For most of us, we feel sleepiest in the early hours of the morning – good thing we’re already asleep. We also might feel sleepy in the afternoon, which is why we want to take a nap. Each of us has our own rhythm. Some of us are naturally night owls. Some of us naturally want to go to bed early and wake up early. Circadian rhythms are regulated by light and darkness. A newborn baby doesn’t have a circadian rhythm yet, which is one reason babies sleep at weird times. Soon, they will settle into a more regular pattern of sleep. Babies and young children need lots of sleep for healthy brain development. Did you know there are two different types of sleep? NREM is quiet sleep. During this time, your body can heal and restore itself. During REM sleep, your brain is active and you dream. Circadian rhythms can get messed up by stress, unpredictable schedules, or caffeine. Eating a heavy meal before you go to bed can interrupt your sleep – and your circadian rhythm. Animals, plants, and even fungi have circadian rhythms that tell them when to eat, sleep, mate, and migrate. Question: How much sleep should kids get? What can I do to sleep better? Answer: School-age kids need 9 to 11 hours of sleep each night. If you’re having trouble sleeping, make sure you get plenty of exercise earlier in the day. Avoid caffeinated drinks and turn off the screens at least two hours before bedtime. Learn why sleep can make you smarter.